A recent study conducted at Baylor University in Baylor, Texas has shown an interesting link between psychosis and a person’s ability to thwart the dreaded contagious yawn. If you’ve ever sat next to someone in class or in a meeting who began yawning and then suddenly felt an overwhelming urge to yawn yourself, you’re not alone. Humans have a natural instinct to “catch” a yawn from others out of mere empathy and human connection. Yes, yawns are in fact, contagious. To a certain degree. Yawning Is Contagious. According to an article in Psychology Today, “It’s not just in your head: Yawning is contagious, not just in humans but in many species. It’s even contagious between us and our dogs.” Yep, even Fido can “catch” a yawn from you (and vice versa). Except When It Isn’t. Nearly all humans (and other animals) are affected by the yawning contagion out of empathy, but as always, there are some exceptions. Have you ever known anyone who didn’t catch the yawn? Have you ever seen anyone seemingly unaffected when someone else yawns and wonder, “how do they do that?” You’re not alone. The Empathy Factor. Psychology Today explains the phenomenon all boils down to the definitions and in empathy in general. “Empathy is one of the core psychological factors that leads to catching yawns,” explains the author. It is an innate human quality to empathize with those around us. Psychopathy Definition. To take this explanation further, researchers took a look at the core factors and tested them against what they know of diagnosed cases of psychopathy. The first step to do this is to understand the basic definitions of both psychopathy and empathy. The Experiment. 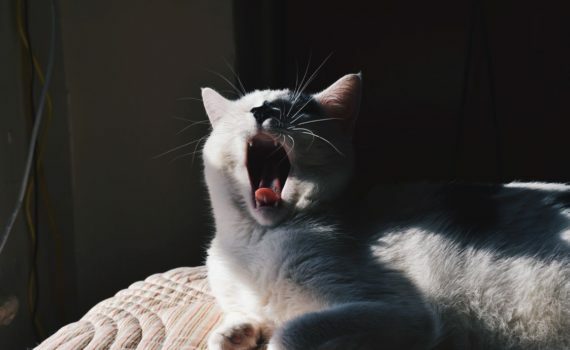 “Researchers at Baylor University had 135 subjects take the Psychopathy Personality Inventory-Revised (PPI-R) and then exposed them to a contagious yawn experiment,” writes Psychology Today. Their results showed a distinct relation between the two conditions. Coldheartedness. What researchers defined as “coldheartedness” was described as showing a stark lack of empathy toward others in the room. Basically, the more “coldhearted” a person was (or the less empathy they possessed), the less likely they were to yawn when others did. Strong Link. Their findings suggested that while one does not equate the other (not yawning doesn’t mean you are a psychopath any more than yawning makes you empathetic), it does prove there is a strong link between the two. It is not a means to diagnose a problem, but it can certainly be a considerable factor. Previous Studies. “A lack of empathy has already been known to relate to immunity to contagious yawning. Studies have shown, for example, that children on the autism spectrum are less likely to catch a yawn. But this is the first study to show its link to psychopathy,” Psychology Today writes. Other Traits. It’s important to understand there are a multitude of traits and factors that come into play when diagnosing someone with psychosis. It’s also possible that there are other reasons behind why people may not feel the urge to yawn when others do. Fearlessness and Other Traits. “Psychopaths also exhibit fearlessness as a typical trait. The researchers tested their subjects to measure how easily they startled; psychopaths would startle less. They found that the less likely someone is to startle, the less likely they are to catch a yawn,” the article explains. Consider the Factors. If you suspect someone near you may be a psychopath, it’s important to base your speculations on more than whether or not they yawn when you do. It can be a clue to an underlying psychopathic disorder, but not necessarily if it’s a stand-alone issue. Traits of a Psychopath. In a related article on Psychology Today, it’s explained there are five key factors that psychopaths have in common. You’ll want to look for fake charm, a lack of remorse, an easily bruised ego or inflated sense of confidence, high risk-takers, and anyone who attempts to manipulate those around them. Not a Diagnostic Tool. “Of course, this is not a diagnostic tool for psychopathy, but it is an interesting connection, showing how these personality traits affect various behaviors in unexpected ways,” writes Psychology Today. So if your partner seems to have no instinct to yawn when you do, you might want to dig a little deeper.